We are currently working on picking paint colors for our new house. Back in the day, I was a huge Desperate Housewives fan, and I loved Lynette’s blue kitchen. Our new kitchen has lots of white cabinets and not a huge amount of wall space, so I thought, why not? And my friend found an article that has the exact paint colors of all the DHW sets so Ryan picked me up a sample the other day. We haven’t put it on the wall yet, but I’m crossing my fingers I like it as much in person than I did on TV. While we are on the subject of TV, can I just say again how much I love Scandal? Love. Except we binge-watched the first two seasons on Hulu last summer and now that we are caught up, it’s very frustrating having to wait an entire 7 days between cliff-hanging episodes. Also frustrating is the fact that it comes on at 9:00, which is about an hour past the time I can stay awake while watching TV, especially when I have had wine with dinner. 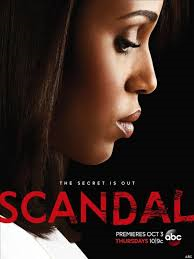 Last night, I gave in to my droopy eyelids and went to bed, and watched Scandal this evening. Sooooo good! Yesterday, Halloween, the weather was nasty. I was in the car in what seemed like a never ending day of pouring rain. By the time I picked up the kids from school and got home, the rain had stopped, but it was still hot and gross outside. Even though I knew we wouldn’t be trick-or-treating, I put the kids in their costumes and we walked around the neighborhood. They both fell asleep. This morning, it was actually cool outside! I jumped at the chance to finally, finally dress Grayson in some of his new fall clothes. He was so cute and snuggly- never mind that by 3:00 it was back up to 80 degrees. Sigh. I put this picture on Facebook the other day, but it’s just so darn funny that I want it on the blog for memory’s sake. Charlotte has an intense curiosity and interest in Grayson’s medical supplies. 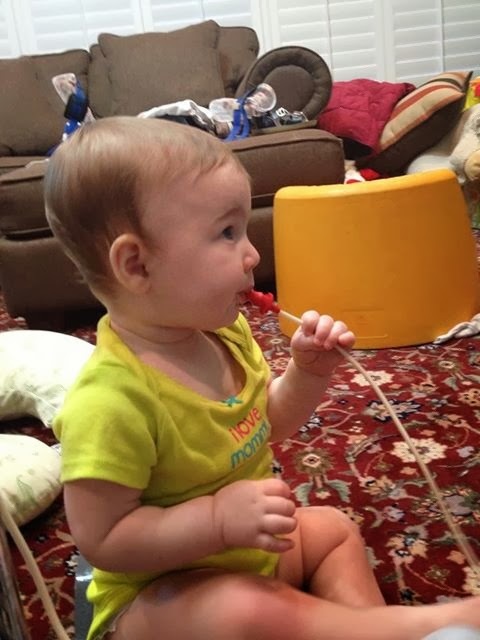 She recently started drinking from a straw, so I guess she saw G’s feeding tube as a really long straw. And hey, it’s formula, so I guess she thought, why not? She is a MESS! You know how you go to Target and come out spending an insane amount of money that you really hadn’t planned on spending? Well today I went to Target and spent an insane amount of money on diapers, formula, wipes, baby food pouches, and food for the weekend. Nothing fun or unnecessary. Being a grownup and keeping little ones fed and diapered is expensive, and sometimes really not any fun. That being said, it’s still fun to walk around Target, isn’t it? 1. I think blue is an awesome color for a kitchen. I can't wait to see the final product! 3. 90 degrees? In late October?!?! The f*ck?! 4. Bwahahaha! She cracks me up. 5. YES! This happens to me EVERY TIME I GO TO TARGET! I'm sorry, did you say $250?!?!? HOW DID THAT HAPPEN?! I have the same problem with Target.. I love Target! Are Grayson's diapers covered by mediciad? I seriously have a huge crush on Olivia too. Her confidence, her clothes, her apartment- aaaa! Medicaid covers diapers starting at age 4. So one more year! We use Target diapers and they work great, so I'm thankful for that because they are a ton cheaper than brand name diapers. That's not true! Reagan had hers covered at 2.5! It just depends on the doctor writing for them and the company ordering them! 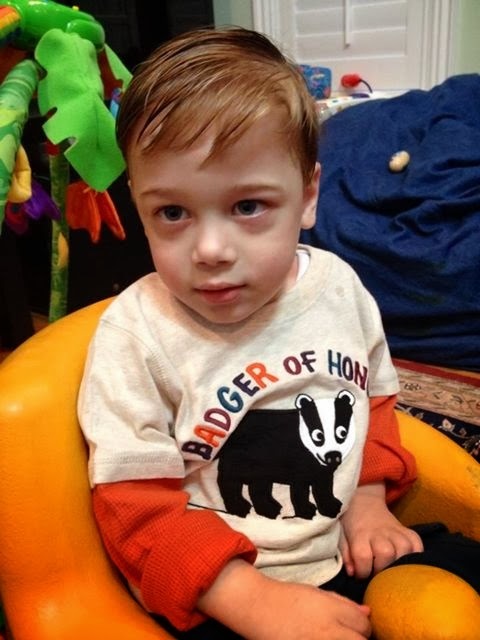 In some cases Medicaid will cover them early… I don't know why, but Matt started getting then at 3. It might be worth a shot. I love the blue!!! Love it so much! I always feel torn between a blue kitchen and a cheery butter yellow… either one with white cabinets. *sigh* But my hubby is all about the dark wood, floor to ceiling, perhaps with a neutral back splash. I don't think we'll ever actually agree on decorating stuff… and I can't see any way that he'll ever give in and let me paint the cabinets white. And blue or yellow walls with dark walnut cabinets? Yuck.